The premise is simple: Take common mediation concepts—including interests, framing, and dialogue-building—and use them not only at the mediation table but also to find and connect with great clients. 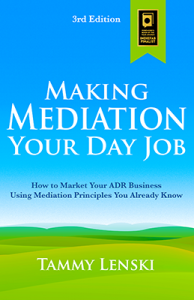 A 2008 finalist for ForeWord Review’s Business Book of the Year and an Amazon ADR bestseller, Making Mediation Your Day Job teaches you how to build a successful private practice by leveraging what mediators already know how to do: Create dialogue. Now in its third edition, Making Mediation Your Day Job was originally written as a series of blog posts, long before that became a “thing.” It’s been read and the ideas successfully applied by thousands of mediators on six continents. Read the introduction now.